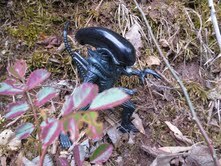 Aliens was a 4 1/2 inch scale line (the size of the human characters) so it makes sense that both the xenomorph and the Predator would be a bit taller. It's tough to get an accurate height for them since they're both somewhat semi posed in "battle poses" but both measure in right around 5 1/4 inches tall. Since he's more crouched, the xenomorph would probably be taller than the Predator. Appearance wise, while they look more like they're movie counterparts they still fit right in with the rest of the Aliens/Predator figures. Kenner nailed a nice simple realism in their movie based lines from the late 80s and early 90s and it shows perfectly here. While the figures are sculpted in a somewhat preposed action stance, they still have the basic five points of articulation: hip swivels, shoulders swivels, and neck swivels. The xenomorph also has a swivel at the base of the tail. All the joints are nice and secure, although the position of the Predator's legs really makes standing difficult for him. He's quite prone to falling over. For action figures of this era and style, though, the articulation is decent. I think the sculpts are easily the best part of this set. I mentioned above that Kenner had a really nice thing going in delivering sculpts that balanced realism while still creating toys, and these two figures exemplify that. 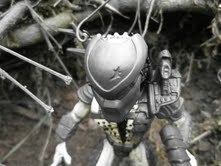 The Warrior Alien is easily impressive in sculpt as most toys released at mass market retailers these days. Every aspect of his creepy exosekeleton, including the rib like elements on his chest and the weird tubes on his back, are rendered nicely with an appropriate level of detail. The tail is appropriately curvy with every segment accounted for. My favorite part of the sculpt is the head, however. It looks great: nice and sleek with a clear dome on top. It's a little dark, but you can see a but of detailing underneath. Truly a frightening toy. 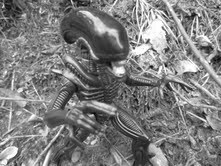 The Warrior Alien has very little paint, as the figure is mostly just molded in a nice black plastic with a little bit of gloss to it. The mouth is painted silver and manages to be nice and clean. Renegade Predator isn't my favorite of the Kenner Predator figures (that distinction goes to the Cracked Tusk/ Lava Planet Predator) but he still manages to have a nice sculpt and fits in with the rest of the figures. The body features a nice wrinkly texture all over that's brought to life with a good mixture yellow highlights and black detailing on the chest. It's a nice, intricate paint job for the figure. Most impressive might be his armor, though. The Renegade Predator features shin and thigh guards, an armored waist piece with a cloth on the back, and a backpack with a shoulder mounted laser cannon that is very similar to the one shown in Predator.  It's an easily recognizable detail and looks pretty good. I just wish the brown armor had a few extra paint details, but alas, it does not. On his left wrist is what appears to be the detonation device that the Predator uses and his right wrist has another device that appears to be the bladed wrist weapon, just with no blades. 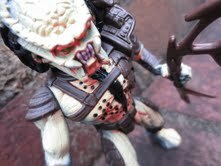 The face sculpt is detailed, but it looks a little squished, almost as if the Predator just ate a sour Warhead. I know that's to facilitate his removable mask (there are holes in the head for the mask to plug in to) but I'm just not overwhelmed by it. 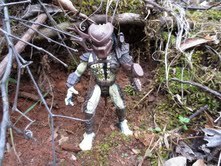 While the Warrior Alien comes with no accessories (although a facehugger would have been nice) the Predator comes with three accessories: his mask, a spear like weapon, and a rifle. The mask is really cool, as it appears to be nearly exact to the mask from the first film. It even has the laser tracker by the right eye. It plus into the holes on the sides of the head and stays on pretty snugly. The laser rifle is another neat accessory and it fits fairly tightly in the Renegade Predator's left hand. It's not something I recognize from anywhere, so maybe it's a trophy the Predator took after a successful hunt? It's got some nice detailing, although the barrel is completely non descript. The spear is my favorite of the two weapons, as it reminds me of a cross between the City Hunter's weapon in Predator 2 and a Klingon bat'leth. Not only can he hold it in his left hand, but it has a peg which allows you to store it on his back. Very cool feature. There's also issue #13 of the Dark Horse mini comics series that came with most of the basic Space Marines and Aliens. It's a fun little comic that sets up the battle between these two guys, always a fun inclusion for kids. Looking back, I'm still amazed that Kenner jumped in and created such a cool set. While I was familiar with both of these guys by this point, I never realized the amount of fans who wanted to see these guys fight. I was certainly not old enough to watch Alien or Predator when these toys came out, but I attribute these toys to making Alien and Predator fans out of lots of other folks my age. It's a great set and while the articulation and paint of these two is somewhat limited simply because of the time period and the style of the figures, they manage to be both fun to play with and look really cool on display. Since I'm rating this against other toys of the time, I'd easily confirm this set as Great. You get two really solid figures and a comic. Fun stuff indeed!